Hollow Hubs feature cold forged and CNC-machined, 6061-T6 aluminum shells fitted with precision sealed bearings and 20mm, 7075-aluminum axles and axle nuts. 100mm front spacing, they also feature oversize, 32mm, dropout interface washers, which further increase the stiffness of the wheels. 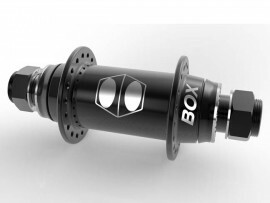 Single front hubs in 32H and 36H are available in black only. Meets or exceeds ENBMX standards.